I debated for a long time how to quilt the background and I kept coming back to the idea of straight lines. I don't usually use my walking foot for anything except binding (see my machine binding tutorial here for all my tips and tricks), but I pulled it out for these lines. The title of this post is a bit of a misnomer, though. 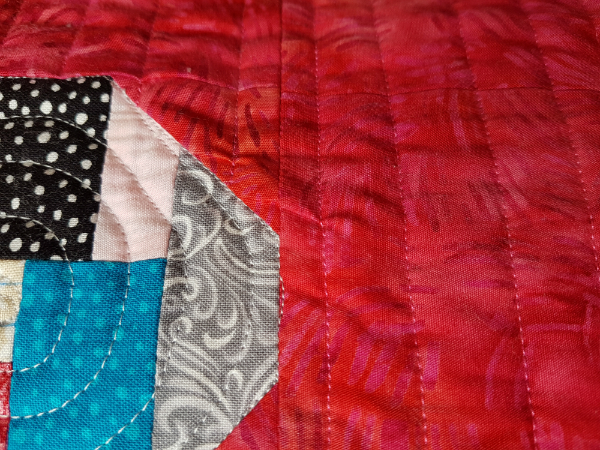 There's not a perfectly straight line in the entire quilt! Every one of them wobbles or even goes completely off course. If imperfections are what give a handmade item its character, then this quilt has character in spades! Isn't that background fabric gorgeous? It's from Island Batik and I love the subtle texture it adds to the large areas of negative space in the quilt. There are subtle variations in the colour too - light pink, dark pink, red and orange are all in there. I have been struggling with one thing, though. I quilted the snowball blocks first since I was still trying to decide how to quilt the background. Now, as I approach the blocks, I find I'm getting a lot of these puckers. I'm trying to minimize them as much as I can, but there's just no way to avoid them completely. I'm not quite sure why they're happening. I don't remember there being any fullness in the quilt top when I finished piecing it and I thought I had it basted securely enough. I'm wondering if more basting would have been helpful. And it may just be because I quilted the blocks first. If you know how I could avoid this in the future, I'd love to know! And the back is perfectly flat too, even right by the blocks. The back of the quilt is another beautiful print from Island Batik. The first time I checked the back of the quilt I thought it was full of puckers, but then I realized it was only the dark lines in the print. Phew! With an unexpected morning off today because of snow (yes, snow! 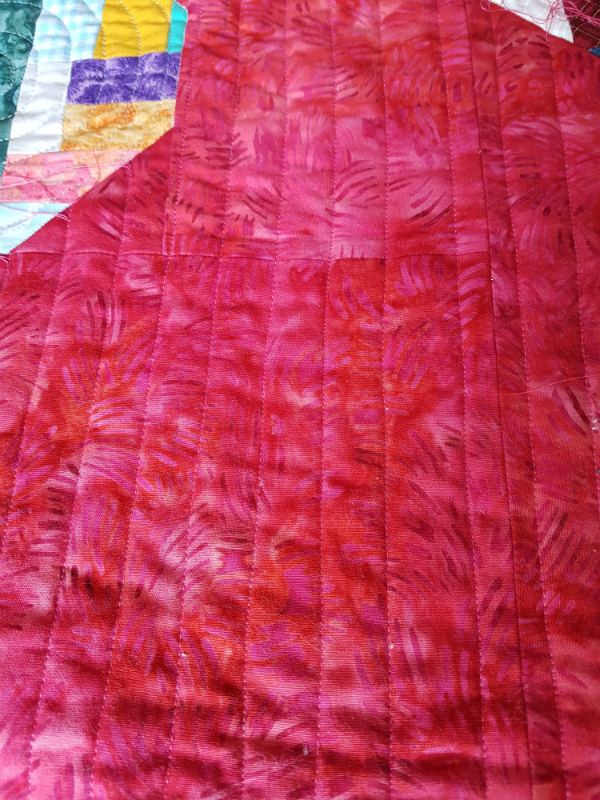 ), I have about 11" left to quilt, which shouldn't take much longer. I may even get through it all this evening, which would be great. I have this scrappy binding all ready to be put on as soon as I can finish the quilting. One last thing...my Churn pattern is still available at the introductory price for another couple of days. Saturday morning I'll be changing the price, so get it now to save 25%! Get your copy at either my Payhip or Etsy shop. Did you turn down the presser foot pressure with the walking foot? If I keep the same pressure setting as when I'm piecing I end up pushing the top fabric along more than the bottom and will get puckers. I can't wait to see the full reveal! Love very interesting, waiting for the reveal. It looks great. Good luck with the last bit. Sorry to hear about the snow, but I'm soooooooooo glad it missed us. But it was cold here today. What sewing machine and walking foot do you have? Are you able to lower the presser foot pressure? I use my walking foot a lot, and the walking foot that came with my machine (Juki) would not feed the fabric correctly - and constantly had puckers like yours - when crossing parts already quilted. I switched to a different brand walking foot that fits my machine, and voila! 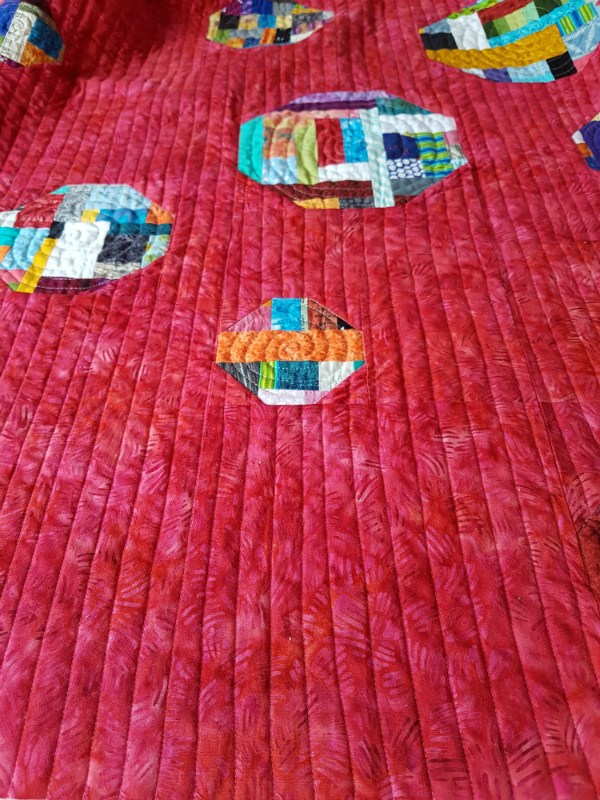 Perfect quilting! Can't wait for the reveal! You've done a fantastic job teasing us as you went! 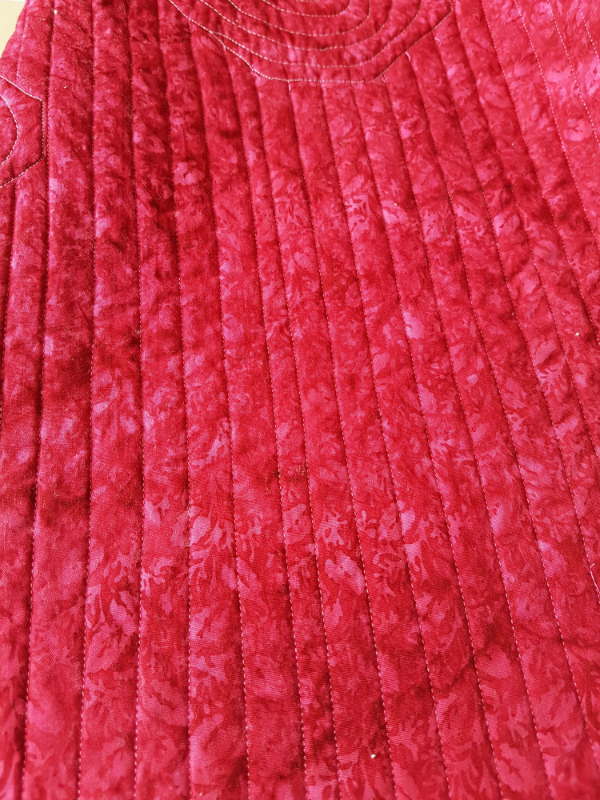 I have a similar problem with puckering when quilted lines intersect. Decreasing the presser foot pressure definitely helps. I stitch fairly slowly and use my fingers to gently push the top fabric under the foot as I'm going along - this does help too. 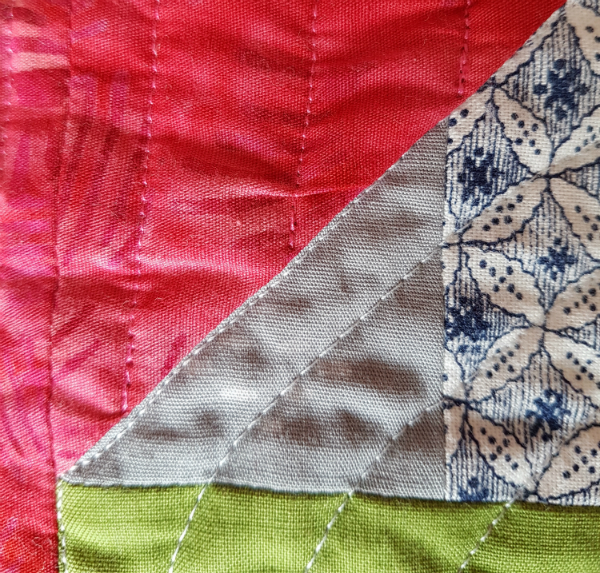 Not that anyone is going to notice the puckers, just the lovely organic texture your lines have added to your quilt! I don't have any advice on the puckers. I usually use my AcuFeed foot (Janome) and it helps with that. I love the red fabric background! So pretty! 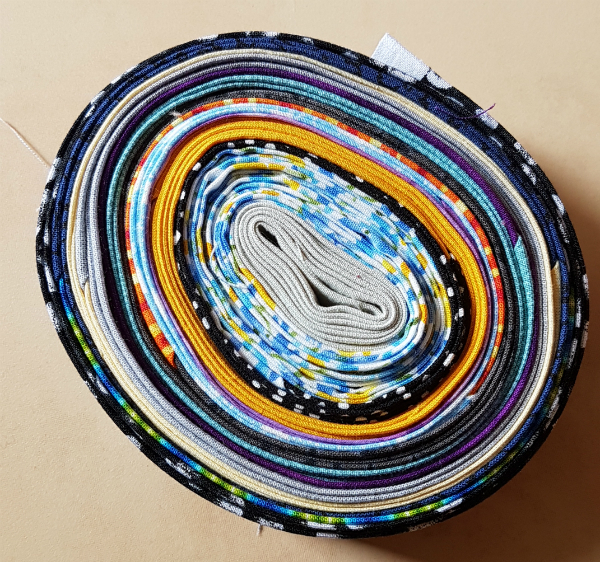 And the roll of binding is swoonworthy! Organic lines are definitely the way to go Leanne, uniformity is boring :) Looking forward to the big reveal too.